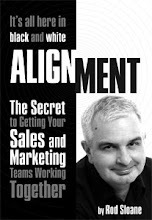 On June 21st I will be delivering another 'taster' workshop on Sales and Marketing Alignment. Why should you bother spending a morning with me? Well, if you want to improve the customer buying experience, understand your buyer's journey and be able to understand when they are moving to their next stage, then please join me in Ealing on Tuesday June 21st. This is an exclusive event for Sales and Marketing Directors only.